The Expendables exploding YouTube channel! Sylvester Stallone and the rest of the Expendables hit US theatres today - and they have an exploding YouTube channel! 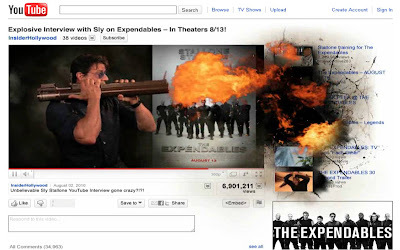 The Expendables YouTube execution is reminiscent of the Nintendo Wario Land YouTube page from a couple of years back, but the Expendables page makes it very easy to share the link - Sly even reminding visitors to do so at the end! Nice example of Owned driving Earned. Furthermore, the Twitter share button posts a tweet with the link, but also includes the hashtag #dont4get2share - easily trackable through Twitter Search. Whilst the use of a bit.ly link enables clicks to be tracked and bit.ly are currently showing that the link has so far been clicked 35,576 times across all the channels it has been distributed on. Wario Land Shake It YouTube takeover destroys the page!